International Journal of Research in Health Sciences,2015,3,1,214-216. 1Professor and Head, Dept. of Pathology, Osmania medical college, Hyderabad, Telangana, INDIA. 2Assistant Professor, Dept. of Pathology, Osmania medical college, Hyderabad, Telangana, INDIA. 3Associate Professor, Dept. of Pathology, Osmania medical college, Hyderabad, Telangana, INDIA. 4Senior Resident, Dept. of Pathology, Osmania medical college, Hyderabad, Telangana, INDIA. Anaplastic thyroid carcinoma also called undifferentiated carcinoma is uncommon aggressive tumor of the thyroid and accounts for 1-2% of all Cancers in the thyroid. Herein we present cytomorphological features of 2 cases of anaplastic carcinoma thyroid. Clinically both the cases were of elderly age group and presented with nodular thyroid swelling with recent rapid growth in the size. 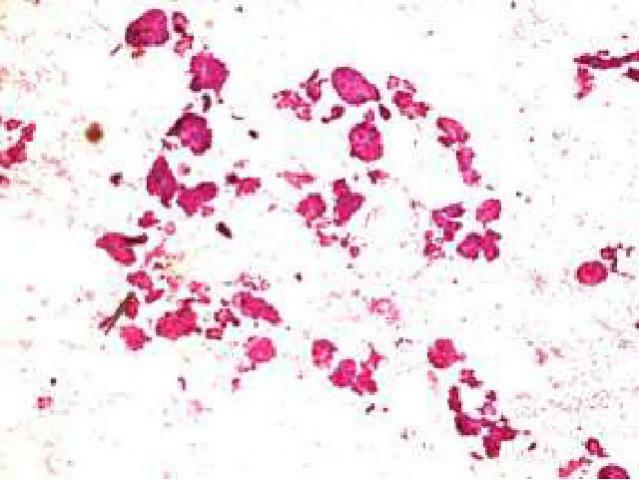 Fine needle aspiration cytology was done showed pleomorphic giant cells, papillary fronds and follicular structures, diagnosed as anaplastic carcinoma thyroid/poorly differentiated thyroid carcinoma. This variant can arise from well differentiated papillary thyroid carcinoma and is associated with grave prognosis. Hence awareness of this entity with early diagnosis helps in prevention of development of anaplastic carcinoma.